In an era of widespread comedy nerddom and an unprecedented interest in obscure comedic history, there is something to be said for reviving a forgotten theatrical personality like Lord Buckley. He was undoubtedly unique; a British-American monologist who created a persona that was equal parts Wodehousian British nobility and be-bop preacher. A lost countercultural icon who boasts an impressive list of disciples including Lenny Bruce, Del Close, Frank Zappa, Robin Williams, George Carlin, and even Bob Dylan. 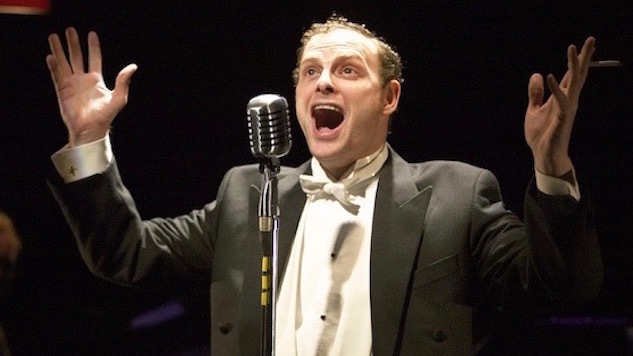 And in His Royal Hipness Lord Buckley, Jake Broder’s tribute to Buckley’s act, directed by David Ellenstein and currently playing at 59E59, we certainly get the full Buckley. Broder himself takes the stage as Buckley, assisted by a playfully square Michael Lanahan and backed by a dynamite jazz trio (Mark Hartman, Brad Russell, and Daniel Glass), recreating (and sometimes updating) Buckley’s signature bits: “hipster” variations on Charles Dickens, the Pied Piper, the Gettysburg Address, and the life of Jesus (“the Nazz”). But there’s a problem, and one that emerges almost immediately. The premise of Lord Buckley’s act is a kind of grotesque masterclass in cultural appropriation. Though Buckley’s idiosyncratic mash-up of British stateliness and black american speech patterns may have been a countercultural novelty in 1955, in 2016 it reads as incredibly racist. And yes, the history of American culture is the history of cultural appropriation, so theoretically why don’t we have a similar problem with, say, an Elvis tribute act? The difference is that Broder’s Lord Buckley fully admits up top to co-opting midcentury black American vernacular for his own ironic purposes, essentially saying, “black people have created this cool thing, and now it’s mine.” After completing his first bit (“I don’t mess wid no barley no more. I wish I’d given it all away when I had it. Now, I’m a spook, Dere gonna be three more gas lightin’ spooks comin’ in to see you,” Buckley says as A Chistmas Carol’s Jacob Marley—spelling taken from the provided script), Buckley is informed by Lanahan’s “Hip News Guy” that some people in the audience are offended—wait for it—by his sullying of the classics (read: white literature) with the “hipsemantic.” No, Buckley. That’s not the issue here. What makes it all the more frustrating to watch is the fact that the show is clearly speaking to a progressive audience with what it feels is a progressive point of view. Broder is clearly a Buckley superfan who believes that what these dark times need is His Royal Hipness’ message of love and un-squareness. I can see where he’s coming from and feel comfortable assuming that his heart is in the right place. The audience is onboard too. They laugh at the Trump jokes, and applaud both digs at Bannon and the veneration of the 13th amendment as the original “Black Lives Matter.” But that does not excuse the face that a largely homogenous audience is applauding an all white cast in what is essentially an act of minstrelsy. By the time Buckley is combining “Georgia On My Mind” with what appears to be dialogue from a lynching that employs seemingly every theatrical racial stereotype known to man, the show has gone completely off the rails. This is not to say that Lord Buckley should be permanently scrubbed from the annals of comedic history. That would be a mistake. But His Royal Hipness Lord Buckley exhibits no reflection on the Buckley character’s problematic premise. At all. There is a fantastic play buried in here that both admires Buckley’s performative power and influence while also grappling with the fact that this is no longer okay. This hypothetical show would be deserving of Broder’s considerable skill and charismatic stage presence. But, as performed for the elderly, white subscribers at 59E59, it simply makes for a tone-deaf and incredibly uncomfortable ninety minutes. Graham Techler is a New York based writer and performer. You can follow him on twitter @grahamtechler.